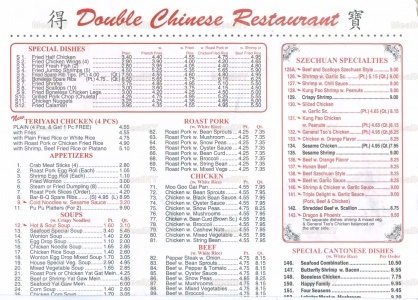 The quintessential/stereotypical Chinese menu. From MealNY. “Let’s get Chinese food tonight.” What do you wear? Whatever you’re already wearing, right? But if someone were to say “Let’s go for French food tonight?,” you would probably do a quick mental run through of your closet to figure out what to wear and oh crap, do we have a reservation? There’s an assumption upon which both answers are based. Chinese food is cheap, French food is expensive. But not all Chinese food is cheap, and not all French food is expensive. American Gothic. From Art Institute of Chicago. The food you and I eat, people grow it. People harvest it. People buy it. People prepare it. People serve it. And, sometimes, people deliver it right to your door. When we separate the people who make an object or commodity from the object and commodity itself, its social value. We can only focus on the object itself. Karl Marx calls this the fetishization of commodity. Basically, there’s a social value in a scarf that your friend made you, or that you bought from the maker, but little to no social value in the scarf that you ordered online. We’re able to divorce the maker and the process of making from the item, only assigning it value based on its practical purpose. This is your political legacy, Bob Ney. This and a 30-month sentence for corruption charges. Nice. Photo from Take Part. A rose by any other name is still a rose, but shouldn’t we think about why are we trying to avoid the word rose? The words we use have power. Names shape the view of what it refers to. A huge part of this power is in how unassuming names can be. Generally people don’t analyze the name of something to which they were just introduced. We accept names. It isn’t until much later that one might really think about the implications of names and naming and how they direct people’s thinking (including their own) about something. Those in power often assign names, thus reflecting their perspectives. This only serves to perpetuate their own power by creating a structure wherein they decide what has value, allowing them to retain their power. It’s basic physics, really; an object in power tends to stay in power. There are all sorts of ways in which I could start writing about SNAP benefits, formerly food stamps. I could draw you in with a statistic. I could try to describe a situation in which someone who is on SNAP might be in. I could horrify you with stories of need. All of that takes away from the fact that there are people who rely on SNAP benefits to feed themselves and their families. These people have different experiences, have varied situations, and are, first and foremost, people. Making the idea of hunger dramatic serves to shock. I’m not here to shock you. I’m here to talk about reality, and that is sometimes shocking. think food blogs are great. Really, I do. They highlight how food is connected to the lives of the people cooking. Food doesn’t exist in a vacuum. It’s easy to lose sight of the ways food is inextricably connected to the world in which we live. Food bloggers write in a format that makes the reader recognizes the connection. Deb Perelman didn’t just make a recipe for a cake, she made a lightly spiced apple cake to keep it delicious for other kids, but to make her own gingerbread-loving son happy. It can feed 40-50 people, but has directions for a single layer sheet cake, cupcakes, and an eight inch round, all of which Perelman has made for different occasions. There are reasons why the food is the way it is. Food bloggers remind us that food is adaptable to our environment, wants, and needs. Good Housekeeping published this article in March of 1942 which explains that "There is no need to ration your family on cake even though sugar happens to be rationed." In January of 1942, the United States Office of Price Administration began to limit the amount of various products that any resident could buy. Tires were the first product to be rationed, but soon nylon, cars, typewriters, bicycles, and gasoline were also rationed. Most rations began sometime during 1942 and all were lifted by the close of 1945 .